Registration is NOW OPEN to host a regional contest for the national Young Playwrights for Change! 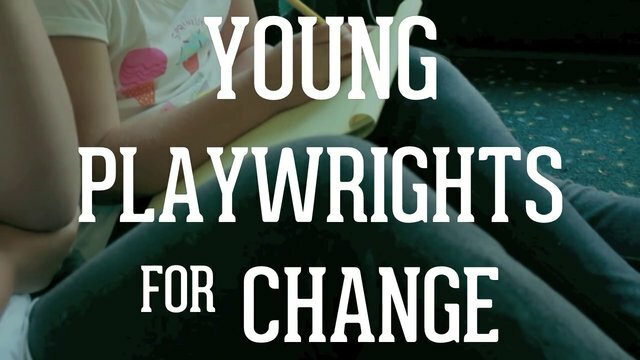 Now entering our third year, Young Playwrights for Change is a collaborative national middle school playwriting competition run by Theatre for Young Audiences/USA (TYA/USA) and the American Alliance for Theatre and Education (AATE). The mission of Young Playwrights for Change is to produce meaningful conversations that will ripple across our nation to provoke change. Our goal is to spark conversation and discussion throughout classrooms, schools and communities. This year’s focus is Young Playwrights for Change: What do you want to change about the world? You can let the students entering your contest focus on any issue they like, from income inequity to peer pressure. It is also fine for a regional competition to focus on one issue (bullying, environment, etc) if it prefers. If you have a funder who would support a competition about gender inequality, then go for it. If a teacher partner is studying the environment and wants to tie these plays to their curriculum, go for it. Are you frustrated by the inequity in income in our country? Do you want people work together to improve the environment? Are you sick of stereotypes of teens and the way some adults treat teens? Do you want to stamp out racism? Homophobia? Gender inequality? What would you do to change your school to make it a better environment for everyone? Do you wish your peers judge people less by what they look like? Then write a 10 minute play about it! Write a game show or soap opera or zombie apocalypse play about the issue you are passionate about. Make all the characters leaves on a tree or bring an alien from another planet into the scene. Use your imagination to create an entertaining, thought provoking, theatrical short play about what you want to change in the world. Young Playwrights for Change offers students a new way to explore and express how they feel about important issues. It gives them a voice and lets them speak to their peers and the adults in their lives in a new way. So follow this link and officially sign up to host a regional competition! We will be posting several blog entries from experienced Young Playwrights for Change regional hosts to share their successes and lessons learned from the past. Here in Omaha, we only got two submissions the first year we hosted a regional competition. However we did reach over 200 middle school kids with a playwriting workshop, so it was a huge success for us. The second year (with lessons learned and a new teacher partner) we got over 30 applications and over 250 middle school students reached with a workshop!